The Scouts’ annual Easter Walking and Activity Week to Castleton in the Derbyshire Peak District will take place during the first week of the Easter holidays from Friday 30 March (Good Friday) to Friday 6 April 2018. We have a varied programme including hill walking, swimming and other activities such as cycling and low-level climbing, as well as the opportunity to head into the local village and activities & games in the centre. We have exclusive use of the Rotary Centre in Castleton, with several buildings including a purpose-build dormitory block with bunk bed accommodation in rooms of four and central heating. 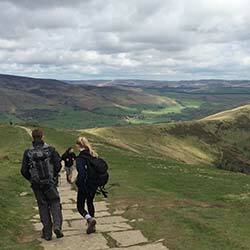 Walking groups are based on age and experience, and are led by an experienced leader or instructor. For the older Scouts there may be the opportunity (weather permitting) to go wild or high camping, an experience that will leave some great memories. The cost of the trip is £240 each; a non-refundable deposit of £50 is required to secure your child’s place. The cost includes all transport, activities, accommodation, and food and represents excellent value for money for a full week away. Numbers are limited to 40 Sea Scouts from both Troops (Renown and Solebay) and will be allocated on a first come, first served basis. Walking boots (not DM’s) and decent waterproofs are essential for this trip, and the Group has a number of good quality waterproofs and rucksacks that can be hired. There is a small hire charge of £5 per item to cover wear & tear and to help cover the cost of cleaning and replacing them. These borrowed items will be collected at the end of the week before we return home. We hold a pre-trip meeting for parents and those going on the trip at The Den on Tuesday 6th March at 7.30pm, All those attending the trip should attend. Group equipment will be available to hire on this evening. If your child would like to go on this trip, please print and return the slip on the letter linked below together with your deposit as soon as possible, but no later than Friday 26th January.